After breakfast, James and I made up a big batch of Pottsfield Relish. 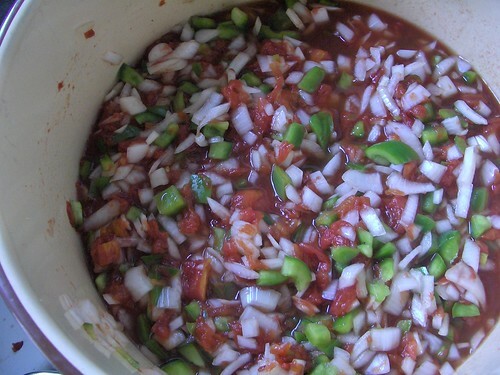 This is from my grandmother's recipe -- it's a sweet tomato, onion and pepper relish. I actually found other versions online (varies as Pottsfield and Pottsville) which include cabbage, but the basic recipe is: tomatoes, onions, green peppers, a bit of vinegar and sugar. That's it. Cook on stove 40-45 minutes or until thick. Ladle into jars and hot water bath process 10 minutes. USE: This stuff is great to add to recipes, on top of potatoes, on top of mac-n-cheese and all sorts of things. My grandmother always put it on top of meatloaf and pot roast while they baked in the oven. As kids, we relished chilled Pottsfield relish on top of a bubbly open face cheese sandwich. NOTES: After going out on my own, I continued to make Pottsfield Relish and applesauce every year -- even if I didn't have the time or resources to make other preserves. These two things are staples in my kitchen. However, I've always double, triple or quadrupled the recipe, spending hours over the sink with a pile of large plum tomatoes, scalding them, seeding them, cooking them down. I always reserve the juice from the seeds to strain and reserve with the juice I pour off the tomatoes before adding the onions and peppers -- it makes a great soup base. This year's batch, turned out a bit different -- it was a lot more watery and the tomatoes really cooked down lot. I seeded the tomatoes, but didn't cook them down before adding the peppers and onions. I didn't peel the tomatoes (they were really ripe and I thought they would just dissolve). It's been years since I have used tomatoes that weren't plum tomatoes for this -- now I remember why! Plum tomatoes have stronger meat and hold their own in cooking a lot better. The result tastes great, but looks a bit different from last year's relish (I've got the last quart in the fridge having opened it only two weeks ago when tomatoes appeared imminent).